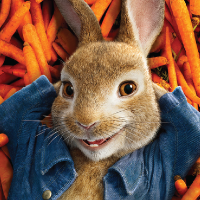 Friday, May 17, at 8:00 p.m.
South Bay Bible Church is pleased to announce their annual Summer Movie Night schedule that will get underway on Friday, May 17, 2019, featuring Peter Rabbit. Five movie nights will fill the outdoor screen before the final show is staged on September 20. Most importantly, the movies can be enjoyed without any cost or offering whatsoever. South Bay Bible Church also provides movie theater-style refreshments without cost. The church hopes these “no strings attached” events brighten the community. “We just want people to know that God loves them,” said Martin Hawley, senior pastor. Summer Movie Nights at South Bay Bible Church will begin with Peter Rabbit. Peter Rabbit and his three sisters -- Flopsy, Mopsy and Cotton-Tail -- enjoy spending their days in Mr. McGregor's vegetable garden. When one of McGregor's relatives suddenly moves in, he's less than thrilled to discover a family of rabbits in his new home. A battle of wills soon breaks out as the new owner hatches scheme after scheme to get rid of Peter -- a resourceful rabbit who proves to be a worthy and wily opponent. Open seating begins at 7:30 p.m., and Peter Rabbit begins at 8:00 p.m.
All movie nights will be screened on the front lawn of South Bay Bible Church at 578 Montauk Highway, East Moriches, New York. All movie enthusiasts are welcome to attend. No reservations are required. Please bring your own lawn chairs and/or ground blankets. Movie nights are rain or shine. If rain, the movie night will be moved inside a very large tent. South Bay Bible Church started in 2006 with the mission to lead people into a growing relationship with Jesus Christ. The Church is comprised of a group of people committed to follow the teachings of Jesus. South Bay Bible Church organizes many popular events throughout the year free of charge for the entire community just to show people God’s love. For movie trailers and additional information, please visit www.southbaychurchli.org/movies. Family Movie Nights will continue with Christopher Robin on June 21; Small Foot on July 19; Ralph Breaks the Internet on August 16; and Mary Poppins Returns on September 20.